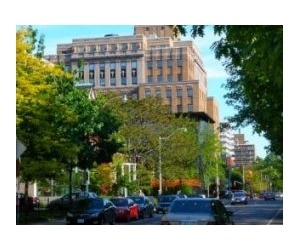 Location: Our central administrative offices are located at 170 St. George Street, on the 6th floor of the Jackman Humanities Building (JH or JHB), formerly known as the Medical Arts Building. For a map to this location, click here. NOTE: Before contacting our graduate admissions with questions about our programs or admissions, please see the GRADUATE section of this website for detailed procedures and complete answers to most questions. If after reading over this information you have a specific query, please contact us via email. Our offices are open from 9 a.m. to 5 p.m. Monday to Friday (and 9 a.m. to 4:30 PM during the months of July and August). 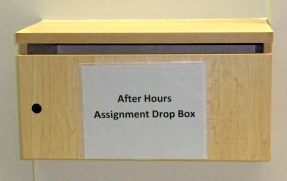 NEW: To submit student work or assignments during office hours, please use the Drop Box located across from the elevators on the 6th Floor of the Jackman Humanities Building (170 St. George St.). NOTE: WE ONLY RECEIVE PAPERS FOR DEPARTMENT OF ENGLISH INSTRUCTORS WHO HAVE OFFICES AT THE JHB. The Department of English is not responsible for any papers submitted in error. Work submitted to this box before 5:00 PM will be date stamped the same day. Any work submitted after 5:00 PM will be date stamped with the next business date. Be aware that all doors to the Jackman Humanities Building are locked after 6:00 p.m. and the offices are closed at 5:00 PM. Instructor's Name (NOTE: THE INSTRUCTOR MUST HAVE AN OFFICE IN THE JHB OR THE PAPER CANNOT BE DELIVERED). Personal items, such as articles of clothing, keys, umbrellas, waterbottles, etc., that are left in the Department of English offices or Department of English classrooms in the JHB, will be held in the Department offices for 3 months, and may be claimed from room JHB 610. After that time, lost items may be claimed from the U of T Lost and Found, through Facilities and Services http://www.fs.utoronto.ca/caretaking/lost.htm . The Accessibility for Ontarians with Disabilities Act (AODA) was passed by the Ontario Government, Ministry of Community, and Social Services, with the goal of establishing a “fully accessible” Ontario by 2025. The Customer Service Standard is the first of five Standards to become law. All Ontario Universities must comply with the Customer Service Standard by January 1, 2010. The Department of English is committed to providing an accessible, equitable, and inclusive learning environment. For accessibility needs, please contact our English Department offices (above), or U of T Accessibility Services. A requirement of the Customer Service Standard is to provide information to all employees regarding the delivery of service. For the University the legislation applies to everyone who interacts with a student, future student, or member of the public. For more information about the AODA, please visit http://www.aoda.utoronto.ca/.